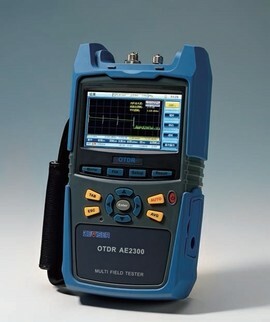 AE2300 Series Handheld OTDR is a high performance, multi-purposeshandheld OTDR. The visual fault location (VFL) could assist OTDRlocate the fault much quicker. AE2300 is the ideal OTDR solution forboth installation and maintenance services. Minimum measurement time could be set to 5 seconds, and within30 seconds a 100km fiber can be measured. One-Button operation allows test result analysis completion in onestep which detect and display the fault location with correspondingmarker. Traditional double markers could indicate the attenuationcharacteristics. Vibration proof, dust proof, humidity proof, 4.3’’ TFT Touch Screen,long operating hours and high capacity lithium battery make AE2300ideal for fieldwork. At same dynamic range, AE2300 has the most cost-effective priceamong all instrument. AE2300 triggers the alarm when light injection has been found at the optical adapter. Warning is provided if optical adapter is stained in order to avoid influencing the test result. Auto calibration function could self-calibrate the instrument after using a certain period of time. High power visual fault locator could be used to locate fiber and find out the break out point within fiber.